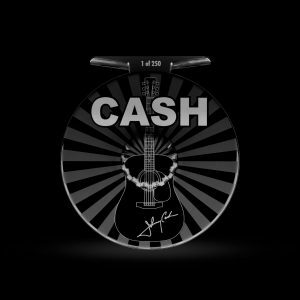 Abel, in partnership with the Johnny Cash estate, has announced the release of a Johnny Cash Limited Edition Fly Reel. “We’ve really outdone ourselves with this design, and we couldn’t be happier to be associated with one of our personal favorites in Johnny Cash,” says Abel Director of Sales, Jeff Patterson. MONTROSE, Colorado – Abel Automatics, Inc., in partnership with the Johnny Cash estate, has announced today the release of the Johnny Cash Limited Edition Fly Reel. Johnny Cash, one of America’s most beloved artists, becomes part of Abel’s legendary hand painted, hand anodized graphic designs. 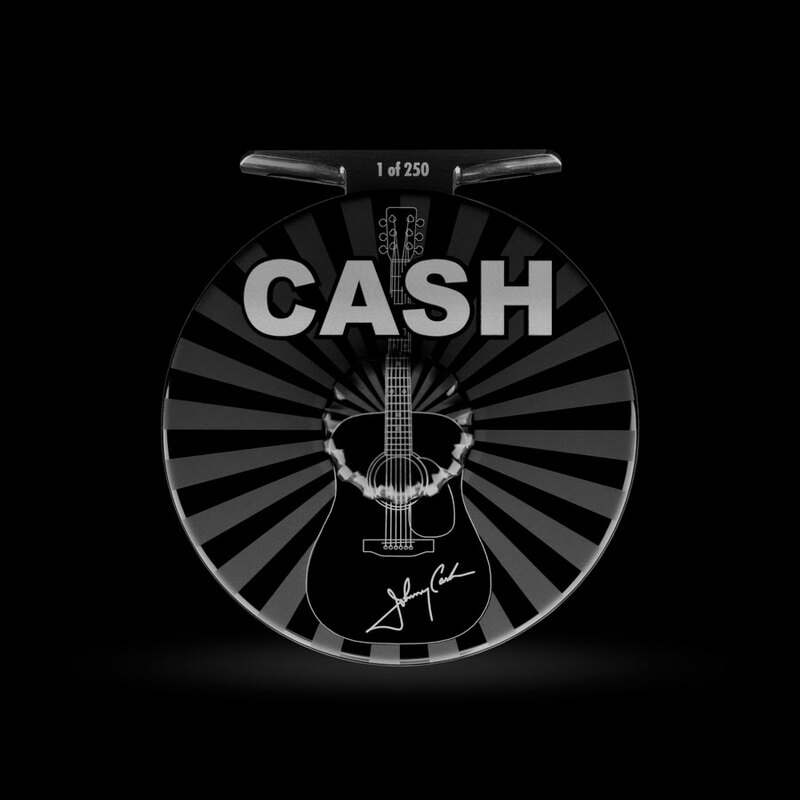 The development project was part of a significant collaboration between Abel’s design team and the Johnny Cash family, bringing the first HD finishes to the market in a limited edition production run. The reel is available immediately, according to Abel Director of Sales, Jeff Patterson. Every detail has been scrutinized, from Johnny Cash’s favorite Martin® D-35 guitar silhouette to the black/satin black sunburst, Abel even developed a new proprietary metallurgical process called HD to achieve different textures and color hues of black for this product. These limited edition fly reels are available in the Super Series model in two sizes, 5|6 and 7|8. Each reel is individually serialized 1 through 250. “We’ve really outdone ourselves with this design, and we couldn’t be happier to be associated with one of our personal favorites in Johnny Cash. We can’t wait to share this reel with his loyal fans,” said Patterson. The design is one that has particular meaning to the Cash family. “My father and I spent years of my young life fishing together around the world. He taught me to fly fish, and I know he would be excited to associate his name with such a high quality product as Abel Reels,” said John Carter Cash. The Johnny Cash Limited Edition fly reels are available through Abel’s premier network of authorized dealers or at abelreels.com. In addition to numerous design awards, Abel Reels have established a remarkable number of International Game Fish Association (IGFA) World Records in both fresh and saltwater categories. While the Abel machine shop existed prior to 1988, it was in that year the first Made-in-the-USA Abel Reels went into production, revolutionizing fresh and saltwater big game fly fishing. The company previously specialized in aerospace and other high-precision metal work. Unique to the industry, all components are made in Abel’s USA based factory on state-of-the art precision machining tools and anodizing equipment. The Thread Shop has established itself as one of the best in the artist merchandising business. The company brings a revolutionary perspective to pop culture branding and marketing, and are committed to providing the ultimate shopping experience—and the highest quality products—for music fans and devotees of popular culture alike. The company touts an impressive and growing roster including A Tribe Called Quest, Bob Dylan, Iggy Pop, NAS, and Miles Davis. With a focus on quality and design, and with an “artist first”philosophy, The Thread Shop works hand-in-hand with the artists and brands they partner with to create beautiful, fashionable and elevated new merchandise and products designed to enhance every lifestyle. Sony Music Entertainment is a global recorded music company with a current roster that includes a broad array of both local artists and international superstars. The company boasts a vast catalog that comprises some of the most important recordings in history. It is home to premier record labels representing music from every genre, including Arista Nashville, Bazmark Records, Beach Street Records, Black Butter Records, BPG Music, Bystorm Entertainment, Columbia Nashville, Columbia Records, Day 1, Descendant Records, Epic Records, Essential Records, Essential Worship, Flying Buddha, Fo Yo Soul Recordings, Insanity Records, Kemosabe Records, Latium Entertainment, Legacy Recordings, Louder Than Life, Masterworks, Masterworks Broadway, OKeh, Polo Ground Music, Portrait, RCA Inspiration, RCA Nashville, RCA Records, Relentless Records, Reunion Records, Sony Classical, Sony Music Latin, Star Time International, Syco Music, Vested in Culture and Volcano. Sony Music Entertainment is a wholly owned subsidiary of Sony Corporation of America.